I look forward to Thanksgiving every year for one reason. It is not the turkey or the mashed potatoes. It isn’t even the pies and desserts, although those are great too. The reason I look forward to Thanksgiving is this awesome Sweet Potato Casserole! It is so delicious!!! We are going to my in law’s house this year for Thanksgiving and I knew that no matter what else I would be making to bring I was also going to be making this! I just finished prepping it and it will be in the oven soon. I cannot wait to eat this tomorrow! 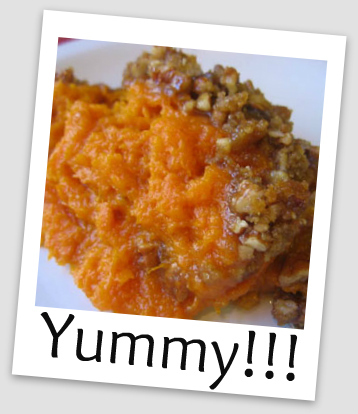 In a large bowl, mix together the sweet potatoes, white sugar, eggs, cinnamon, salt, butter, milk and vanilla extract. Mix until smooth. Transfer to a 9×13 inch baking dish.